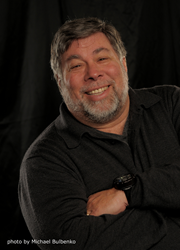 Elliott Masie’s Learning 2015 will feature Steve Wozniak. Elliott Masie has announced another keynote speaker at the 25th Annual MASIE Learning Conference: Steve Wozniak will join Elliott onstage at Learning 2015, taking place November 1-4 in Orlando, Florida. Steve Wozniak has been a Silicon Valley icon and philanthropist for more than thirty years. He has helped shape the computing industry with his design of Apple’s first line of products (the Apple I and II) and influenced the popular Macintosh. For his achievements at Apple, he was awarded the National Medal of Technology by the President of the United States in 1985, the highest honor bestowed on America’s leading innovators. In 2000, he was inducted into the Inventors Hall of Fame and was awarded the prestigious Heinz Award for Technology, The Economy and Employment for single-handedly designing the first personal computer and for then redirecting his lifelong passion for mathematics and electronics toward lighting the fires of excitement for education in grade school students and their teachers. He is Chief Scientist at Primary Data and is a published author with the release of his New York Times bestselling autobiography iWoz: From Computer Geek to Cult Icon in September 2006 by Norton Publishing. Woz will be interactively interviewed by Elliott Masie and the Learning 2015 participants at the Tuesday morning General Session. Learning 2015 is focused on the changing, evolving and increasingly disruptive shifts in the world of workplace and workforce learning. Learning, Training and Performance professionals are invited to Learn, Explore, Benchmark and Engage at the event. Learning 2015 will be held in Orlando, Florida from November 1-4, 2015. Early Registration Discounts and Group Discounts now available. Content and online registration at http://www.learning2015.com.